Weekly Mobile Scoop – 2-11-14 – Have Health Apps Revolutionized the Healthcare Industry? MOBILE HEALTH: Have Health Apps Revolutionized the Healthcare Industry? Thousands of health apps are currently on the market, spurring more patient engagement. With these apps, patients are now able to share health information instantly with their doctors, without an office visit. Will mobile apps become essential for hospital operations? Cisco is the latest to come out with a research report predicting massive rise in mobile use over the next five years. They believe that the number of wearable devices will increase by over 800% in that span. It’s becoming clear that the majority of leading experts expect mobile use to skyrocket. MOBILE MARKETING: Mobile Advertising: Untapped Gold Mine or Waste of Money? Advertisers will spend upwards of $18 billion on mobile advertising in 2014, according to Gartner. The majority of mobile advertising is done randomly as opposed to targeting specific audiences. Will marketers be able to replicate the targeted advertising success on mobile devices, as they have with the Internet? While developers the U.S. and Europe are experiencing more success with Android and iOS platforms, developers in the rest of the world favor HTML5. Globally, Android has been the number one choice, being favored by 71% of developers. Will emerging markets change worldwide mobile development trends? What if you didn’t have to be as careful about what you posted social networking sites? There are several apps, growing in popularity, that allow users to post anonymously. Facebook and Google are expected to try and produce similar apps as well. Are these apps truly able to eliminate the digital footprint? 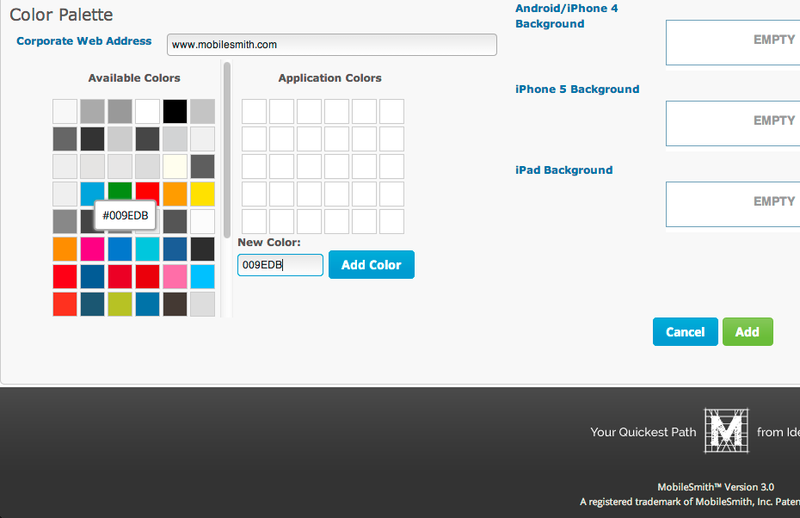 Quickly and easily import your company’s corporate color scheme at the click of a button. Simply type your website address in and let the MobileSmith platform do the rest. Choose the colors you want from the given results for quick use within your app canvas.